تطورت الإمبراطورية المغولية في القرن الثالث عشر من خلال سلسلة من الغزوات والاجتياحات في جميع أنحاء آسيا، حتى وصلت إلى شرق أوروپا بحلول أربعينيات القرن الثالث عشر. على نقيض الإمبراطوريات اللاحقة مثل الامبراطورية البريطانية، والتي يمكن تعريفها "كامبراطوريات بحرية"، كانت الامبراطورية المنغولية امبراطورية برية، tellurocracy، يغذيها العشب الذي يدعم الفرسان والماشية المنغولية. وهكذا فإن معظم غالزو والنهب المنغولي حدث خلال المواسم الأكثر دفئاً، عندما كان هناك العشب الكافي لقطعان الماشية. استمرت الغارات التترية والمنغولية على الدويلات الروسية إلى ما بعد بداية تبعثر الامبراطورية المنغولية ح. 1260. في أماكن أخرى، استمرت المكاسب المنغولية على الأرض في الصين حتى القرن 14 في عهد أسرة يوان، بينما استمرت في فارس حتى القرن 15 في عهد الامبراطورية التيمورية. في الهند، استمرت دولة المنغول حتى القرن 19 من خلال الامبراطورية المنغولية. معركة ڤاليان ضد الأسرة الخوارزمية. 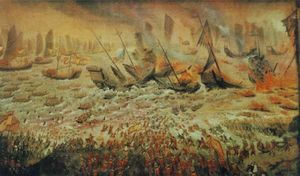 Battle of Yehuling ضد أسرة جين. غزو الامبراطورية المنغولية للأنظمة الصينية وتشمل ممالك لياو الغربية، لورتشن جين، سونگ، شيا الغربية، ودالي. محارب مغولي على ظهر جواده، يستعد لإطلاق رمح. معركة لگنيسا وقعت أثناء الغزو المنغولي الأول لپولندا. الغزو المنغولي في القرن 13 أدى إلى دمار القلاع الحجرية الهائلة، مثل قلعة شپيش في سلوڤاكيا. معركة باتش بدانگ ضد ڤيتنام. ^ Compare: Barras, Vincent; Greub, Gilbert (June 2014). "History of biological warfare and bioterrorism" (PDF). Clinical Microbiology and Infection. 20 (6): 498. doi:10.1111/1469-0691.12706. Retrieved 2017-01-12. In the Middle Ages, a famous although controversial example is offered by the siege of Caffa (now Feodossia in Ukraine/Crimea), a Genovese outpost on the Black Sea coast, by the Mongols. 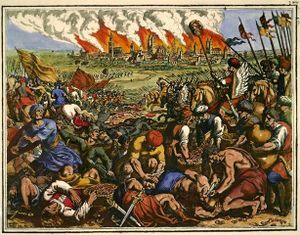 In 1346, the attacking army experienced an epidemic of bubonic plague. 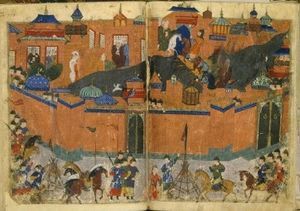 The Italian chronicler Gabriele de’ Mussi, in his Istoria de Morbo sive Mortalitate quae fuit Anno Domini 1348, describes quite plausibly how the plague was transmitted by the Mongols by throwing diseased cadavers with catapults into the besieged city, and how ships transporting Genovese soldiers, fleas and rats fleeing from there brought it to the Mediterranean ports. Given the highly complex epidemiology of plague, this interpretation of the Black Death (which might have killed > 25 million people in the following years throughout Europe) as stemming from a specific and localized origin of the Black Death remains controversial. Similarly, it remains doubtful whether the effect of throwing infected cadavers could have been the sole cause of the outburst of an epidemic in the besieged city. ^ Rakibul Hasan, "Biological Weapons: covert threats to Global Health Security." Asian Journal of Multidisciplinary Studies (2014) 2#9 p 38. online Archived 2014-12-17 at the Wayback Machine. ^ Dugin, Alexander (2012). "1: Toward a Geopolitics of Russia's Future". Last War of the World-Island: The Geopolitics of Contemporary Russia. Translated by Bryant, John. London: Arktos (published 2015). p. 4. ISBN 9781910524374. 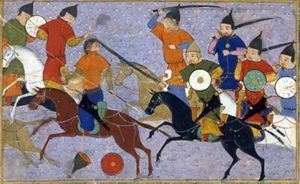 Historically, Russians did not immediately realize the significance of their location and only accepted the baton of tellurocracy after the Mongolian conquests of Ghengis Khan, whose empire was a model of tellurocracy. 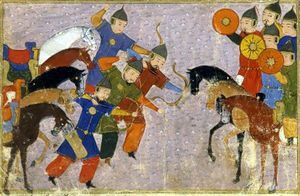 ^ أ ب New Yorker "Of necessity, the Mongols did most of their conquering and plundering during the warmer seasons, when there was sufficient grass for their herds. 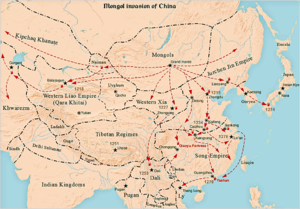 [...] Fuelled by grass, the Mongol empire could be described as solar-powered; it was an empire of the land. Later empires, such as the British, moved by ship and were wind-powered, empires of the sea. The American empire, if it is an empire, runs on oil and is an empire of the air. Smith Jr., John Masson (Jan–Mar 1998). "Review: Nomads on Ponies vs. Slaves on Horses". Journal of the American Oriental Society. American Oriental Society. 118 (1): 54–62. doi:10.2307/606298. JSTOR 606298. 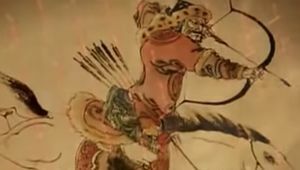 مشاع المعرفة فيه ميديا متعلقة بموضوع Mongol conquests.